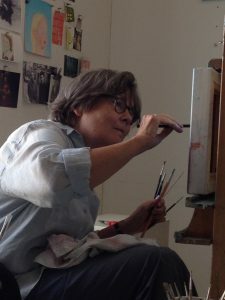 Marleen Habets is born in Kerkrade, in the southern part of the Netherlands in 1950. Until 2000 she worked as an orthopedagogist and child psychotherapist in various institutions for mental health care. In 2001 she ended this work and decided to become a full time visual artist. In 2007 she graduated from the Minerva Art Academy in Groningen. Currently Marleen lives and works in Goirle, southern Netherlands. “My work is about the fragility of life and human existence. It is about the beauty that lies within imperfection, about care and concern. Usually I paint portraits. I try to visualize the lifelike side of people; their imperfection, their beauty and vulnerability. Occasionally I paint landscapes or abstract works. These paintings are images and memories of beauty and impressive emotions.